Did you know that Fido is Latin for faithfulness? Can’t bear to leave your furry faithful at home? Us neither! You don’t need to when you vacation in Portland, Maine. 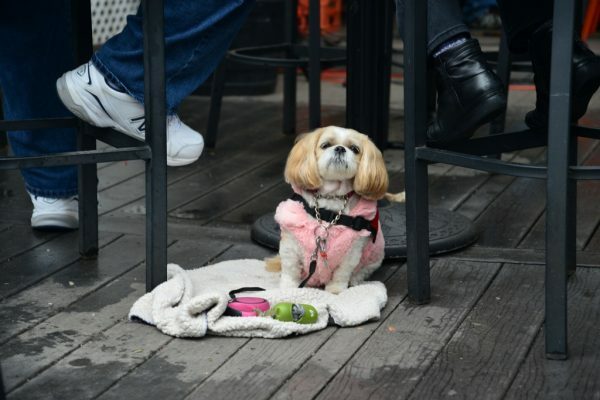 Our tails were wagging at the number of restaurants, hotels, parks, and beaches that rolled out the red carpet for our pooch while visiting last weekend. A local magazine ranks the state #1 in the country for pet-friendliness. For lunch, we dined on the deck of the Portland Lobster Co. A 3-piece acoustic set calmed our canine while we enjoyed fresh lobster rolls and paw-sized pumpkin pints under hot heat lamps. Later in the day, we strolled around the salty merchants of downtown. Pet parents like to support retailers who put water bowls at their shop’s entrance. We popped into the Black Dog store where a portion of my embroidered fleece purchase goes to help dog adoption and vet pet efforts. At the nearby Fish & Bone, we fitted our spoiled princess with a bright school-bus-yellow rain jacket to avoid the light drizzle. Our dog drooled as we sat deck-side (as always) at a meat lover’s paradise called The Thirsty Pig. The Pig’s specialty kraut hotdogs are best paired with an annual bacchanalia called Hoptoberfest. We found three dry chairs on the back patio to listen to live music while repeating “Prost!” until dark. The next morning, we gave Renee a little “life off the leash” time at East End Beach. Bigger, stronger and louder mutts played catch with their owners while Renee was content to stalk snails in the sand and lap up salt water. She’d never been to the ocean before.